A little town of about 13,000 inhabitants on the east edge of Pest county, 60 kms from Budapest, by road 31. It was inhabited already in the Arpadian time, its first mentioning is from 1221. In the 1848-49 war of independence it was the headquarters of Artúr Görgey during the battle at Tápióbicske. In the Keglevich mansion there was a war hospital visited by Lajos Kossuth after the battle. The St. George church is from 15th c., the Baroque Keglevich chapel from 18th c. In St. George park there are three 18th c. statues. The monument of the battle at Tápióbicske was made in 1897. 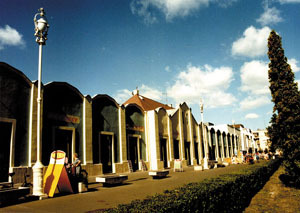 The bazaars from 1910 are characteristic buildings of the town. 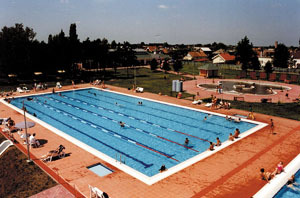 In the open-air bath there is a thermal water pool of 59 degrees C and a fine swimming-pool. Next to the town, the Tápió-Hajta Nature Conservation Area is the home of many rare, protected animal and plant species. Important events: spectacular town celebration on the anniversary of the battle at Tápióbicske (4th of April) with traditional soldiers, hussars (light-horsemen) and Artillery; international dance festival at the end of August; celebrations with ball and fireworks on 20th of August.